Welcome to Garden Bloggers' Bloom Day for January 2012. Here in my USDA Hardiness Zone 5B garden in central Indiana, winter finally arrived last week after ten plus days of above average temperatures. 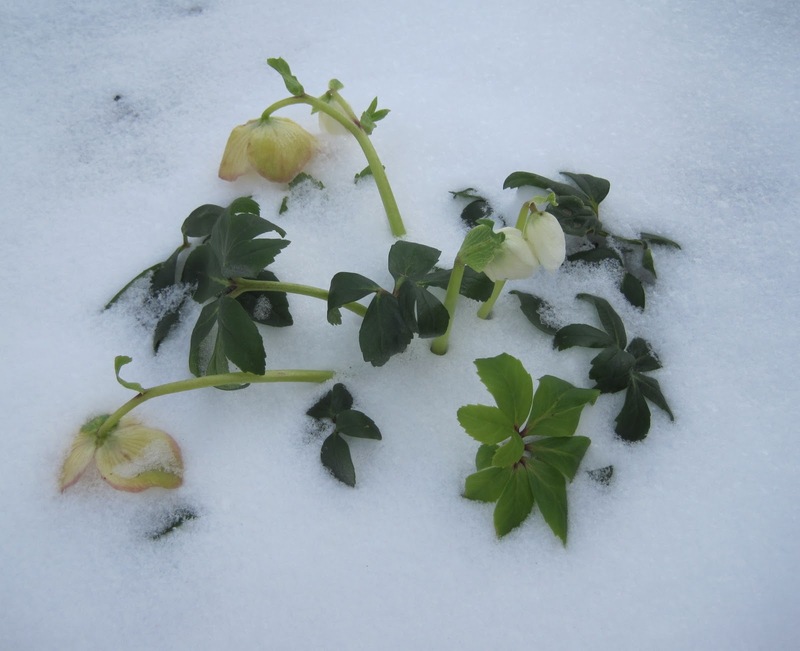 This helleborus, which has been blooming since mid-December, is frozen in mid-bloom, half covered by snow. When warm days return, which we are told will happen in a few days, I'm sure this plant will go right on blooming. It's a great addition to my winter garden. Elsewhere in the garden, the snow cover is enough to remind me of what I left standing last fall. The birds picked the seeds from these long ago. The birds likely didn't eat these seeds so I'm sure I'll have many dill seedlings in the garden this spring. Remind me it isn't necessary to buy any dill seeds. 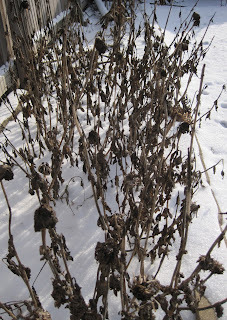 These are not the prettiest flowers for winter interest. In fact, they look quite weedy. There is some green in the garden. These chairs are made of composite wood and should do just fine even though I've left them outside. Note there's a trail in the lower left by the chairs No doubt that is a rabbit trail leading to the shelter of a nearby spruce tree. Or perhaps it leads to a gigantic rabbit hole, the kind I could get lost in for the rest of the winter. With blooms like these outside, a gardener has to do some indoor gardening to ensure some bloom in her life. I planted some paperwhites on New Year's Day to enjoy in the depths of winter. These will be blooming in another week to ten days, I hope. For those who have been posting for Garden Bloggers' Bloom Day since it's beginning back in Feb. 2007, this post marks the end of the fifth year of bloom day posting. Wow, that means some of us have five years of online records about what blooms in our gardens each month. Thank you to all those gardeners who have participated in this meme sometime during these past five years. You've helped make this a fun way to keep an online record of blooms. What about your garden? How is January treating you? Whatever your circumstances and however your garden looks during winter days, I hope you’ll join us for Garden Bloggers’ Bloom Day this month. It's easy to participate. Just post on your blog about what is blooming in your garden on the 15th of the month and then leave a link in the ‘Mr. Linky’ widget below, plus a comment to give us a hint as to what we might find in your garden in January. Love the adirondack chairs in the snow. Happy first GBBD of 2012. I love 'Josef Lemper' Christmas rose and hope yours does go on blooming. Our weather has been so warm that I have lots of hellebores to show. Congratulations on five years of bloom days! It's such a cool way to keep track of what's blooming year round. Yes congratulations on the anniversary of your fantastic meme. It's been a pleasure to join in, and to take a trip around the world to see what's blooming. The snowbound Hellebore does look lovely. Your photos show that winter has definitely arrived. Congrats on your five years. It has been most appreciated. Thanks, Carol, for hosting this wonderful meme! And congratulations on your anniversary! Congratulations on your fifth year anniversary of this wonderful meme! 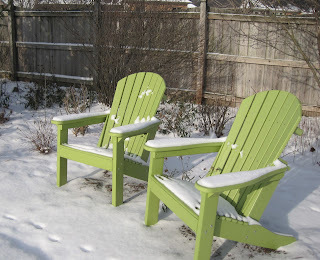 Love your Adirondack chairs against the white of the snow...just perfect! Also happy first GBBD of 2012-thanks for being our hostess! Five years of Bloom Days - Wow! Congratulations on the success of your meme. I look forward to Bloom Day each month. What a wonderful winter to have added a H. niger! Most of our winters are solid snow so as that they would not have seen the light of day. This winter has left me longing to add some of those blooming beauties to my garden... but will we ever have another winter like this one? The kicker. Enjoy your blooms for me, Carol! Congrats on five years! Pretty amazing record you've compiled. I had a Hellebore too, until the snow arrived on Wed.
Wow five years of bloom days! I've only just started joining in but I look forward to many more. Adirondack chairs in the snow, dreaming May dreams... I hope May brings you plenty of dill seedlings! Happy Bloomday. Such an amazing contrast to wander in from my baked midsummer garden to enjoy the images of your snow-covered garden - one of the joys of being able to visit gardens around the world via your wonderful meme. Congratulations on your five year anniversary. Five years? Wow! Give Carol a virtual bouquet. I have roses, or water-lilies! It looks really cold in Indiana! Its a bit frosty (just) in Ireland. Many hardy annuals still haven't died down yet. 5 years of BBD - that's really great! I always enjoy it and glad I discovered your blog. Always look forward to BBD posts. Happy 5th anniversary. I found the gbbd meme last month after I'd posted the bloom for Dec... I was like.... next month 4 sure! Nice to see your seedheads... Having gardened in the midwest, I remember how important winter interest is... And was incredibly surprised by the waste going on in southern gardens in the name of "tidying". At last you have snow and we have frost! However, everything's still topsy turvy here in the southern UK. We could really do with a proper drop of winter. 5 years, wow! Thank you for prompting the rest of us gardeners to keep this record through Bloom Day. I refer back to my older posts frequently. 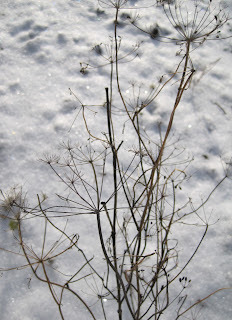 Your dill comment reminds me of my bronze fennel. One plant bought nearly 10 years ago has led to lots of it throughout the garden. I guess it is a good thing I like it. Congratulations on five years, and thank you for hosting! What a great record to have! I love the look of the dill with its seeds still on. This warm weather is definitely playing havoc with the plants! I had an iris that almost bloomed before a frost came. You got more snow than we did over in Ohio. Hard to believe it's already the middle of January. Thanks for hosting such a fun site! I'm glad I have something to share! In January, I hope to have cabbage and broccoli ready to pick! The snow looks beautiful BUT glad we're in shorts and T shirts today!!! Finally we have snow as well... just in time for the cold weather... nature's perfect protection for our sleeping gardens. Good post Carol. I liked the sunflower shot as much as the hellebore. Congratulations on having your first January blooms outdoors. Perfect for celebrating your 5th anniversary of Garden Bloggers' Bloom Day. I hope to be a member of that group some day. A little more time management and I think I can swing it! Congratulations on your Anniversary. Only just started doing this and am having problems linking to your site. We have lots of snowdrops and hellebores flowering at the moment, plenty of other flowers with the mild weather. 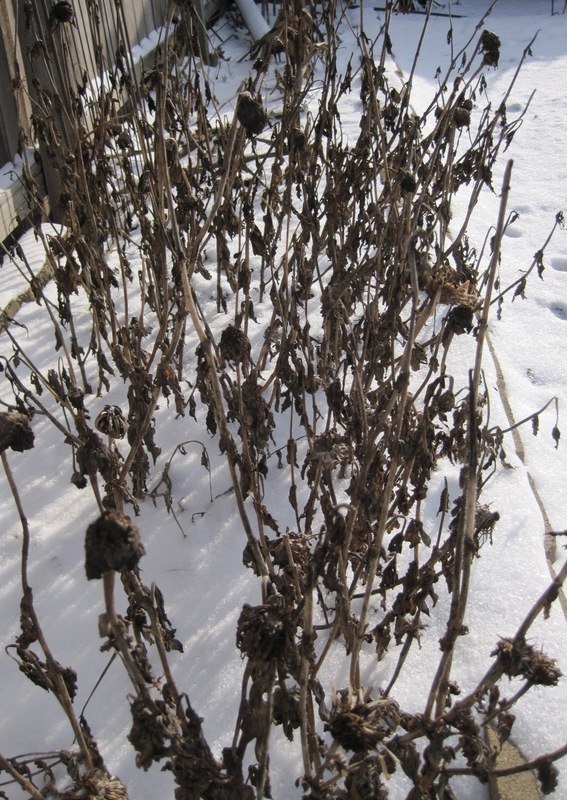 So great that you left the blooms and foliage as winter interest in your garden. I love those green chairs! Such a nice way to add some color in your winter garden. I had to laugh at the "green" (chairs) in your garden! How sad for the helleborus, but comforting to know it will keep on blooming after the snow has melted. Congratulations on 5 years of GBBD! I have been participating for a year, and I love being able to go back and see what bloomed last year. Having 5 years of records must be a wonderful thing to have, for any gardener. Happy GBBD, and happy anniversary! Thank you so much for providing this for the crazy gardeners of the globe. I really look forward to it each month. I can’t believe your hellebores are that far along! They look so pretty in the snow. The Lot is also in Zone 5b and winter just made it’s first appearance here as well. Our hellebores were an inch or two out of the ground. Love your photo of the sunflower stalk as well. Would be quite pretty as a black & white print. Congratulations on five years of Garden Bloggers' Bloom Day, Carol! Thank you for sharing your blooms each month and for encouraging us to share ours! We've been expecting quite a bloom at our place, despite the snow. Link on over and take a look. I love paperwhites. Mine are just coming into bloom. Well done for hosting five years of Garden Bloggers' Bloom Day. This is my first attempt at taking part, only five years late. Congratulations on five years of a great meme. I've missed only a couple since I started blogging in '07. It is fun to look back and compare the garden visually from year to year. We have got to get you some Galanthus elwesii. Remind me this spring to dig up and send you some to plant by that great hellebore. 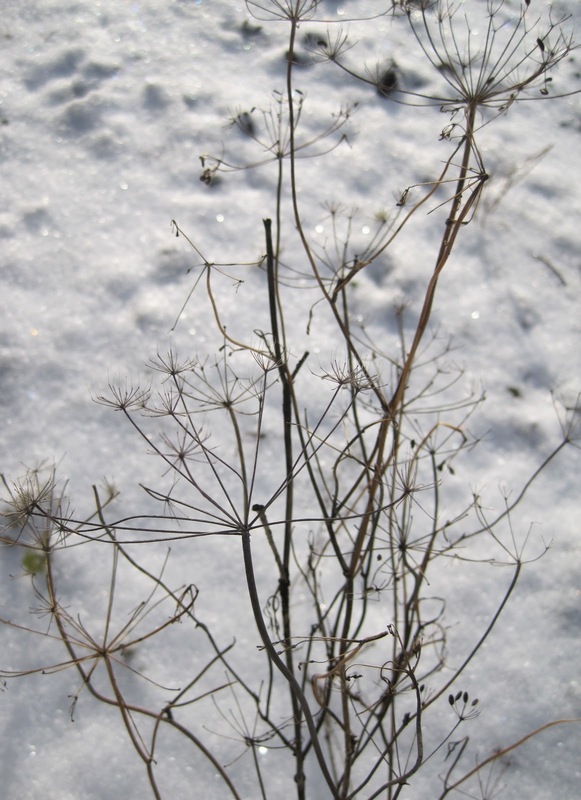 Love the shot of the dill against the snow. Congratulations on five years of Garden Bloggers' Bloom Day! Thanks for hosting Bloom Day! Love seeing the photos from your garden. We seldom see snow here in Houston, so it’s a treat to see your garden in winter. This is just my second time participating here but I am so glad to have found you. It helps me keep a garden log of what is going on each month! Happy Anniversary! Thank you for getting me out to the garden to look with a purpose and create a record of blooms. Thank you for hosting Bloom Day. I always look forward to seeing the gardens from all over the world. And congratulations on the five year anniversary. This is my first year Bloom Day anniversary! I love seeing some snow! Happy GBBD! Five years of Bloomday, wow! I will have been participating for 3 yrs when my blog turns 3 in March. I guess that makes me a middle aged Bloomer. Love the opening shot of the snow buried Hellebore! It's funny to me that you are 2+ zones cooler than me an your Hellebore has been blooming since mid-December and mine are just starting to pop out of the ground! Congrats on 5 wonderful years - your green chairs look winsome in the snow, as does that hellebore - great shot! Carol, I'm so glad you're hosting bloom day, it really helps me see what's going on in my garden over the months. Love the hellebore! Winter finally showed up here in the Seattle area yesterday and it's been snowing ever since. I love that Hellebores are blooming at this time of year and that they could care less about the snow. Oh, look at that Josef Lemper! I do hope by typing it, I can recall it and find one. Beautiful snow. And love the chairs in the snow. Thanks so much for GBBD. Stillll jealous of your Helleborus! I think all of your last year's flowers look good in the snow. I love your chairs! I showed some of my seedheads and a few indoor blooms. I am ready for the next couple of months to go by as quickly as last summer did. This is my 3rd year of blogging. I found the bloom day posts right away, and joined right in. Thanks, Carol! Some lovely photos. I am glad to see you got a hellebore. It is beautiful. Thank you for hosting and congratulations on being a popular host for so many years. I think forced bulbs are the best present a gardener can give ourselves. My narcissus are done; hyacinths are about to start. Tulips will follow. It's indoor gardening at its winter best. wow! Has it really been 5 years? My how the time flies! Looks like your snow day is snowier than ours this January bloom day. Stay warm! I just love your green chairs! I really must, must, must add hellebores to my garden. Beautiful even frozen. You will enjoy your Paperwhites. I sure do! No snow here in DC (yay! ), but the same hellebore in bloom and the bitter cold has moved in, still some blooms to show and some signs of the coming spring. I am 5 years too late, but better late than never, yes? This is my first meme I am joining as a new blogger. Thank you for letting me play along. Wow, your garden looks so different from the (non) winter we've been having. Some day I need to garden in a place that gets covered with snow. A real winter actually looks kind of appealing to me. Congratulations and thank you for the five years. Bloom Day is the single greatest thing in the garden blogosphere. Interesting that Indiana has been having a strange 'winter' as well as us - but though we have our much-awaited frost now I think we'll be lucky to see snow like you have! Congratulations on your five-year anniversary too - I've been doing GBBD for a couple of those years but all credit goes to you for hosting it so well and so long. Thank you! I'm a complete sucker for flowers, so thanks for hosting this each month! I had taken some pictures of plants and pots covered with snow but had hesitated to post them until I saw what you did. Thank you for giving me inspiration and may you continue GBBD for many more years. It is so much fun! Oh those snowy garden chairs! That's real winter. We are having summer weather and loving it - except when we think of the dry conditions for our poor plants. Still, it's making some nice California natives bloom, just in time for bloom day! Thanks Carol, for hosting, as ever! Wow, five years of GBBD?? Amazing. I think it's only been a little over three years for me. Love your snow shots (and those chairs). 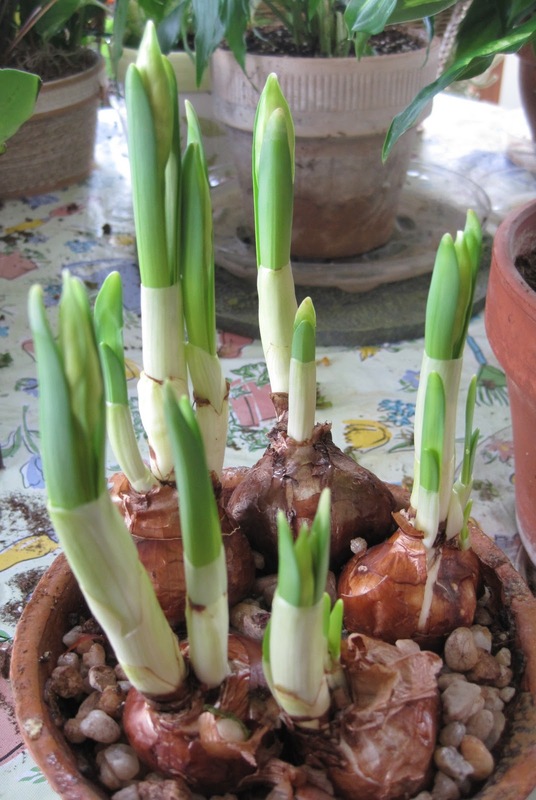 We've had warmish weather and all the bulbs are waking up! Hello Carol, because of our time difference, I can't really post here earlier, hahaha! I have been opening many times yesterday but after sleeping for the night i am already at the tail of the list. I have been trying to be here first to give some warmth to what I know is most of the bloggers' deep winter snow. I can provide you some warmth and colors aside from those white, grey and brown. Anyway, better late than never. LOL. Thanks for your delightful blog and most of all for Bloom Day. I love looking at Bloom Day posts to find out what's going on in other people's gardens. And it inspired me to take the time to look around my own garden on a regular basis... and once I did that, I had to start a baby blog to have someplace to post my pix. So thanks so much for the inspiration. Congratulations on five years, Carol! I think I've been participating for about two years, and I enjoy it so much every month. I have three Camellia x. 'Winter's Snowman' in bloom this month - my only flowering plants. Your hellebore inspires me! similarly un-average weather over here - we must be living in un-average times. Thanks for enriching the blogosphere Carol. Five years.... five years!!! Well one of them was on Maui and now four years later I got the same old snow and a few drops. This is definitely the most challenging month to find something in bloom. I was pleased that just the process of posting encouraged me to go out in the cold and discover blossoms! What a blessing GBBD is to all of us! I'm trying to find that rabbit hole. 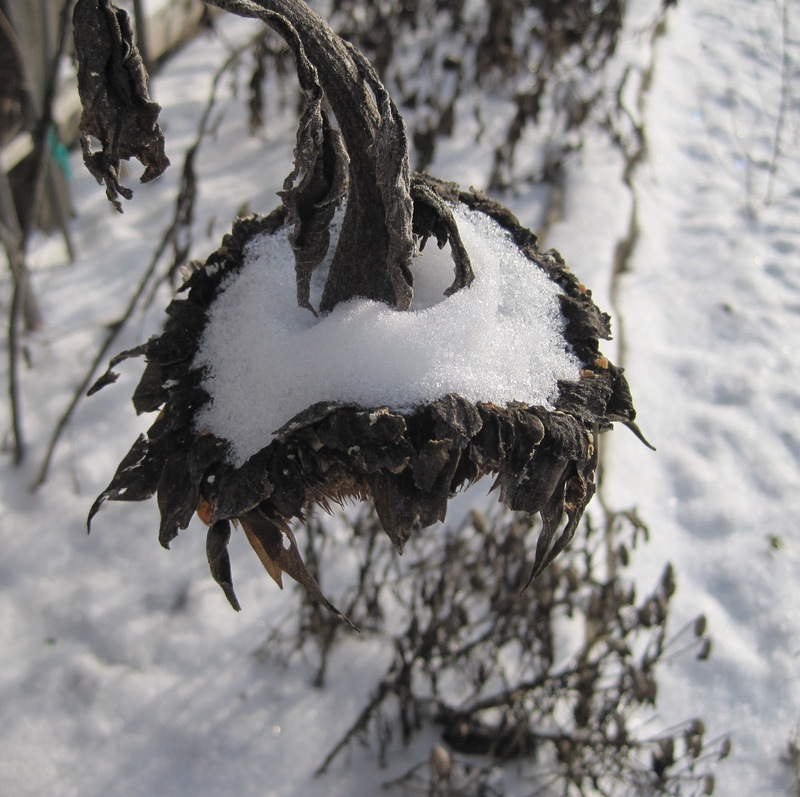 Why weren't the sunflowers pulled out in the fall? It seems to me that a cold and frozen Hellebore may trump not having any Hellebores at all! Has anyone joined you for GBBD every single month since you started it in February 2007? I've missed a few months but counted 66 past months with an entry. There were a few flowers today, so here is entry #67, January 2012 GBBD. The verification word is "boodyinc" sounds like the name of an artifical derriere manufacturer. Snow-dusted, lime green Adirondacks -- be still my heart! Congrats on five years of Bloom Days, Carol. Carol your garden looks like mine except for those green chairs...love that color in the snow...I have to get ore organized and start some bulbs indoors next year. Happy anniversary...5 years and still going strong..congrats! Congratulations on 5 years of GBBD, Carol! This is such a great meme--I think I haven't missed a month since I started blogging, not quite 4 years ago. I really appreciate having these posts as a record of what was blooming when. Today, my garden looks much like yours, minus those lovely green chairs, that is. Wow - 5 years?! How time flies in the garden - and on the blog. It's been a pleasure to repeat myself on bloom days and has been a really great record of our blooms. Thank you so much. Enjoy those hellebores - we're still waiting for ours to open. Maybe in time for next bloom day! Well, i'm thinking of spring due to the seed catalogs and lack of snow thus far...you remind me that I should check on the hellebores! Congratulations on the five year anniversary! Thank you for hosting! 5 years. Wow. I hope that I will continue to be with you for the next 5. Thanks for hosting this. I can't believe it, but I've been joining in on GBBD for 4 years now. I don't make 'every' one but I am glad you keep it going and we can join in when we can. As usual, I am slightly late getting here;-) Thanks! Better late than never...thought I'd join in with a few blooms from my garden this January. Thanks again for hosting, Carol. And thanks for hosting this for all of these past years -- that's a LOT of blooms! Hi, I'm a newbie, congrats on your 5 years. Looks like I've been missing a lot. But I'm glad I found your blog and thank-you for hosting. Have a great weekend.